Riding the metro in Beijing the other day, listening to Wolf Parade’s track ‘Valley Boy,’ I suddenly had this moment of vertigo as my mind was riding the 55 bus up blvd. St-Laurent back home in Montreal. ‘Valley Boy’ is a tribute to Leonard Cohen, our city’s patron saint of letters. Wolf Parade, though from Vancouver Island, are also a Montreal band. A few minutes later, my friend, Darryl, who is in Montreal from Alberta this week, sent me this photo. There is nothing more alienating than to feel yourself in a city over 11,000km away from where you are. But I was in Montreal. But not the shiny Montreal of 2017, the grittier Montreal of the early 2000s, when the Main was half dug up in construction, and the rest was littered with discarded coffee cups and remnants of the weekend’s detritus. In those days, it wasn’t uncommon to see Cohen wandering around, visiting his favourite haunts, talking to the occasional person brave enough to actually approach him. I never did. He was Leonard Cohen, He wasn’t a man for small talk, or pointless conversation. I did, though, meet Cohen once, a long time ago. It was the early 90s, he was touring behind The Future, and in a laundromat in Calgary, there he was folding his laundry as I was putting mine in the dryer. It was a random meeting and he dropped a sock, I picked it up for him. We talked for a bit, about nothing and everything and then he went on his way. I still don’t know why he was doing his own laundry on tour. Montreal is changing, soon it have the newest infrastructure of any city that matters in North America. Every time I go home, I hear more and more English, and not just downtown, but on the Plateau, in the Mile End and in my old haunts in Saint-Henri and Pointe-Saint-Charles. But even worse is the creep of major chain retailers. It used to be that Montreal was a holdout against this invasion. It was a city of small shops, mom and pop outfits, all up and down the Plateau, even downtown and in the other boroughs. I bought a stereo at a small store on Sainte-Catherine near MusiquePlus that has been shuttered for over a decade now, killed off by the Best Buy. Montreal is losing its soul, I’m afraid. I take no pleasure in saying this, in fact, it hurts my own soul to say so. But there is a deep and dangerous cost of the gentrification of the city. My buddy Steve is a New Yorker at core, even if he long ago escaped. Each time he goes home to Queens, he is more and more appalled by what he sees in Harlem and Brooklyn and even Queens. Sure, it was a safer city and all that, but it was losing its soul. I always felt smug in the belief my city couldn’t do that. And better yet, my city was never crazy violent and it had, by the early 2010s, appeared to have recovered from the economic uncertainty of the separatist era. Hell, for a few years at the turn of the century, Montreal was actually the fastest growing city in Canada. Did you know it was all going to go wrong? Did you know it would be more than you could bear? In interviews, Wolf Parade have hinted this was about the larger geopolitical shitstorm that was engulfing the world when Cohen went to his great reward. As I was riding up the Main on the 55 bus in my head the other day, I thought differently. This was about Montreal, a city they and I have all moved on from, and one that Cohen left many times. Of course, Cohen also said that you can never leave Montreal, as it travels with you wherever you go and it calls you home. Later on the album, Krug sings, ‘Take me in time/Back to Montreal.’ And so we never do really fully leave. Gentrification is a topic I have written a lot about here (for example, here, here, here, here, here, here, here, here, here, here, here, here, here, here, and, finally, here). And, of course, I wrote a book about Griffintown, Montreal. In other words, I think about gentrification a lot, occasionally curious about it, occasionally appalled by it. Ok, then. A few things to note. First, the sign is on dirt/gravel, next to what looks like a new(-ish) sidewalk). So clearly, gentrification is apace here. Second, Five Points is historically home to pretty much the entirety of Denver’s African American population. And, as anyone who knows anything about urban history will tell you, this also means that the congregation of the black population of the city here was not entirely always by choice. And, of course, who loses in the gentrification of traditionally African American neighbourhoods? African Americans, of course. Third, the gentrifiers want this neighbourhood to be a centre for the arts. Not surprisingly, the arts that are native to Five Points are not all that welcome in the newly re-imagined RiNo. Why? Because hip hop is still seen as a black art form, and that makes a lot of white people uneasy, even today after hip hop has gone global. And while the people at ink!’s Five Points shop may have thought they were being edgy and funny, they were not. They were being stupid. And offensive. Yes, gentrification usually means you can get good coffee in your neighbourhood, but at what cost? And who benefits from gentrification in the US? The answer to the latter question is predominately white, young, urbanites with well-paying jobs. And that means that those who lose from gentrification are people who do not look like them, these urban explorers. Gentrification is, I think, as close to an inevitable process as we have. But, that doesn’t mean that it needs to be brainless and lead to the displacement of the residents, and it doesn’t need to mean a whitewashing of neighbourhoods traditionally of colour. I’m reading a book that is, for the lack of a better term, a biography of the Kremlin. I am at the part where the Kremlin, and Moscow itself, gets rebuilt after Napoléon’s attempt at conquering Russia. Moscow had been, until it was torched during the French occupation, a haphazard city; visitors complained it was Medieval and dirty. And it smelled. And not just visitors from Paris and Florence, but from St. Petersburg, too. This was definitely a landscape that belonged to the rich and the educated, to noblemen and ladies of the better sort. It is through the artists’ eyes that we glimpse the well-dressed crowds: the gentlemen with their top hats and shiny canes, the ladies in their bonnets, gloves, and crinolines. They could be leading citizens of any European state, and there is little sense of Russia (let alone romantic Muscovy) in their world. Leaving aside the fact that there were no citizens of any European state in 1814, this sounds remarkably familiar. This is the same critique I have written many times about Griffintown and Montreal: as Montreal gentrifies, it is becoming much like any other major North American city. But it is also true of gentrification in general. There is a part on the North Shore of Chattanooga, Tennessee, I really like. It finally dawned on me that it is because it reminds of me Vancouver architecturally, culturally, aesthetically, and in the ways in which the water (in this case the Tennessee River, not False Creek) is used by the redevelopment of this historically downtrodden neighbourhood. But. I could also be dropped into pretty much any North American city and see similarities: Toronto, Vancouver, Montreal, New York, Boston, Seattle, Portland (Oregon), Cincinnati, Cleveland, Buffalo, Chicago, Atlanta, Nashville. These are all cities (amongst others) where I have seen the same tendencies. And, obviously, one aspect of gentrification is the cleansing of the city of danger and vice. Just like Moscow was cleaned up in the aftermath of 1812. Yesterday, in response to this post, I was accosted on Twitter and accused of many things, most of which were untrue, but most notably of standing by and watching gentrification from the sidelines and not offering any solutions. In and around that accusation, repeated in many different ways, I was also told that ‘gentrification is inevitable.’ Since then, I have been wondering if it is. Now, I must point out that my critic, who ultimately dismissed me as “just a guy in Boston making false judgements about my hometown,” is also a real estate agent and is of the opinion that her neighbourhood, Verdun, is the next up and coming neighbourhood in Montreal. So she has a vested interest in gentrification and rising property values. Not that I don’t, of course, both when I lived in Montreal and now. And it also doesn’t matter which city I visit, gentrification benefits me. I’m a middle-class white guy. But is gentrification inevitable? I was in New York City a couple of weeks ago, on the Lower Eastside of Manhattan. We eventually had dinner on Mulberry Street, on the terrasse of an overpriced, but delicious, Italian restaurant. As I looked up the block, I could see the formerly notorious Mulberry Bend. The Mulberry Bend, when the Five Points still existed, was perhaps the worst bit of real estate in the Western world for poverty and crime. 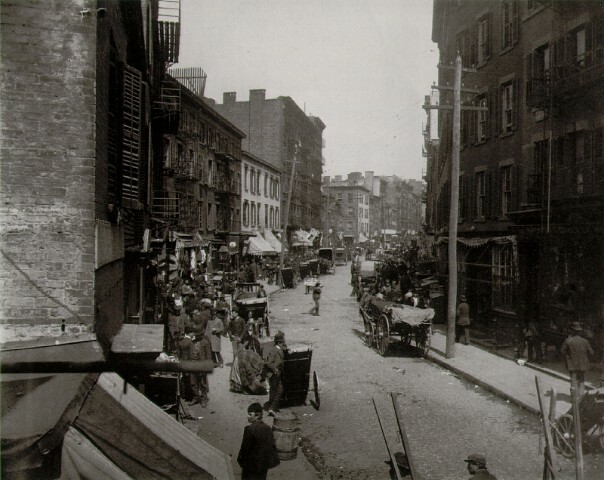 It was central to Jacob Riis’ 1896 classic, How the Other Half Lives. Today, however, Mulberry Street is beautiful and on this sunny Sunday the street was blocked off to cars and a street fair was going on. Even twenty years ago, this wasn’t really all that nice a part of town. But today, it’s all smoothed over and gentrified. But is the kind of gentrification that has occurred on Mulberry Street inevitable? I think it might be relative, it might be locational. Take, for example, New Haven, CT. New Haven is a smallish city and has been dealing with a variety of social problems, from high crime, to drug use, since deindustrialisation in the 1960s and 70s. It has also experienced ‘white flight’ and the people who ended up being stuck in inner-city New Haven had no hope, no option for a better life. And so, New Haven, despite being the home of Yale University, has struggled. On the train into New York City last weekend, I saw its newest solution, called Re:New Haven. The city is offering people up to $80,000 in incentives to purchase a home and live in New Haven. It seems to be working, at least according to the couple sitting next to us on the terrasse on Mulberry Street, who were from New Haven (as is the friend I was with that night, though he no longer lives in his hometown), who reported a boom in new restaurants and other hangouts. On that front, Re:New Haven sounds like a brilliant idea. But there is always a cost for gentrification. In the case of New Haven, African Americans who already live in these gentrifying neighbourhoods pay the cost. New Haven has decided that gentrification is inevitable. And it certainly looks that way on the ground in New York City and Montreal. But there’s also a question of neighbourhood, especially in big cities. If you look at New York City, it’s interesting to note that Queen’s and Staten Island are not getting as much love from the gentrifiers. No doubt because they are rather inconveniently located vis-à-vis Manhattan. Similarly, in Montral, gentrification is in neighbourhoods that are conveniently located in relation to the downtown core of the city. 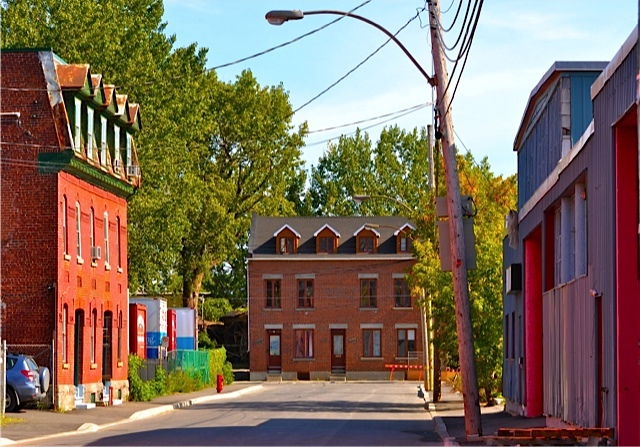 Thus, Saint-Henri, Griffintown and Pointe-Saint-Charles make sense in their gentrification. Even Verdun is no more than 15 minutes from downtown on the métro. But, other neighbourhoods, are more or less free of gentrification, or at least have not been overly affected. Take, for example, Hochelaha-Maisonneuve, or HOMA, a chronically depressed neighbourhood in the east end. Despite attempts over the past decade to gentrify, the neighbourhood remains largely immune. Similarly, neighbourhoods north of the Métropolitaine in the north end of the city are also seemingly gentrification-proof. Collective action against gentrification tends not to work. It happens either way, whether residents welcome or resist it. However, my interlocutor yesterday also had interesting ideas about practical, boots-on-the-ground ways to ameliorate the effects of gentrification for the working classes of Verdun. Pointe-Saint-Charles has long had similar ideas, but, each time I’m back home in Montreal and go through the Pointe, I see fewer and fewer of the old school working classes and the stores and restaurants that served them and more gentrified homes and hipster coffee shops and the like. But what makes gentrification inevitable? A search for cheap(er) housing? A search for The Next Big Thing? Recently, Richard Florida’s thesis about the Creative Class in cities is getting some static, because in many places it hasn’t worked out how he predicted. And yet gentrification carries on. I was in Montreal for a nano-second last week, in and out in 22 hours. As I sat Friday morning sipping a proper café au lait and a croissant amande at Pain D’Oré at Atwater Market, a woman kitted out in cycling gear pulled up outside the boulangerie. She took off her gloves and helmet, and then leaned her very expensive bike up against the shop’s window and came in to get her coffee and croissant. I thought to myself that things had changed in the sud-ouest of Montreal. Not too long ago, in response to a post on this blog about gentrification, my friend Max, who is a gentrifier, and has bought a place in a gentrifying neighbourhood, chided me for being so dead-set against gentrification. I am not necessarily. But I think we need to problematise the process, to recognise what we’ve lost, and so on, to not simply jump into the future unquestioningly. But. He pointed out some benefits about gentrification in his neighbourhood: he could find a decent cup of coffee and he said hipsters, as annoying as they generally are, are safe. He doesn’t have to worry about his wife walking home at night. I thought about that as I watched this woman leave her expensive bike outside the boulangerie, unlocked. When she came back out with coffee and croissant, she moved her bike to her table on the terrasse. I lived in the sud-ouest for the majority of my time in Montreal, mostly in Pointe-Saint-Charles, but also in Saint-Henri on the Last Ungentrified Block in Saint-Henri ™. The rue Saint-Ferdinand, north of Saint-Antoine remains ungentrified. I drove up it last week just to make sure. But the streets on either side of Saint-Ferdinand ARE gentrified, so, too, is the block on Saint-Ferdinand below my old one. So are large swaths of Saint-Antoine. And so on. The first place I lived in the Pointe wasn’t. 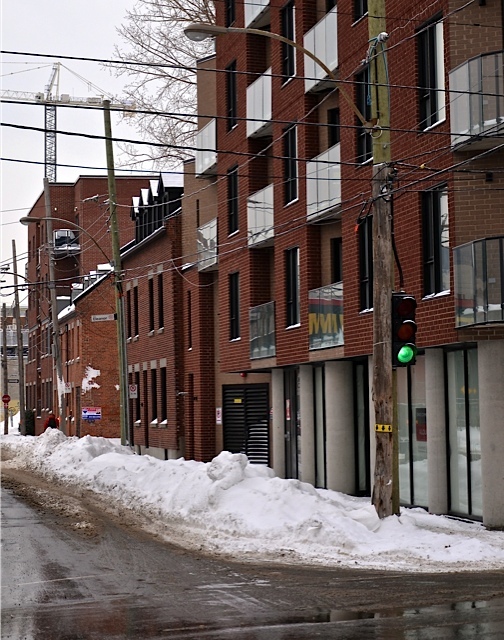 There are housing projects on the block, and my place backed onto the asphalt back lot of a project (Montreal’s projects, I might note, at least in the sud-ouest are not great towering cinderblock apartments, they are usually no more than 3-4 story apartment blocks. They usually fit into their neighbourhoods). My second place was definitely gentrified, as, by that point in my life, I was no longer a struggling student, but a tenured CÉGEP professor. And still. There is no way in hell I would ever leave an expensive bike outside a boulangerie at Atwater Market. I never left my car unlocked. Or my front door. I keep a close eye on my computer bag. Do I just trust people less? Or had I just lived in the Pointe longer than this woman? But, yet, her bike was completely safe, and not because I was sitting in the window. About 15 people passed it as she got her coffee and croissant. And no one even gave the unlocked, very expensive bike a second look. Has the sud-ouest changed that much? Or was her bike simply in a high traffic area and safe? I can’t decide. I should also point out, for American readers, that gentrification in Canada tends not to get caught up in questions of race like it does here in the US. Most gentrifying and gentrified neighbourhoods of Canadian cities are places where inner-city working-class white people lived. So while class is still a very prevalent issue, race tends not to be. There are exceptions. of course, such as in the traditional Anglo Black neighbourhood of Montreal, Little Burgundy, which is undergoing a massive shift right now. But, on the whole, discussions surrounding gentrification don’t centre around notions of race. Then again, few things in Canada do, at least publicly. But that doesn’t mean that race and skin colour aren’t central components to Canadian life. When we lived in Pointe-Saint-Charles in Montreal, we lived about two doors down from a community garden in the shadows of the massive Église Saint-Charles. That community garden had been there as long as I could remember, it pre-dated my first residence in the Pointe back in 2002-4. The people who used it were the poor, working-class and marginalised Irish and French Canadians who lived in the Pointe. But, by about 2009 or 2010, the garden had been taken over by the gentrifiers, forcing out the old school urban harvesters. Many of these gentrifiers thought they were new and unique in gardening in an inner-city neighbourhood. Indeed, this is something I saw over and over again in Montreal, on the Plateau, Saint-Henri, the Pointe, and other neighbourhoods, as hipsters discovered the benefits of community gardens. But they were hardly new ideas in old working-class neighbourhoods, particularly in the Pointe. The Pointe had long had community gardens. Aside from this one in on the rue Island, there was also a bigger one in the shadows of the railway viaduct along the rue Knox. And the problems arise when the original inhabitants of the Pointe were forced out of these gardens by the gentrifiers. The gardens were used to supplement diets, obviously. I also noticed something else when I lived in the Pointe in the early part of the past decade and when I was in Saint-Henri mid-decade. In both neighbourhoods, the local IGA (grocery store), both owned by the same family, the Topettas, opened new, glitzy stores. The IGAs in the Pointe and Saint-Henri had been in grotty store fronts, on rue du Centre in the Pointe, and rue Notre-Dame in Saint-Henri. When the new IGA opened in the Pointe c. 2002 and in Saint-Henri in 2005-6, I noticed a lot of low income families wandering around the stores with a slightly dazed look on their faces, complaining about rising prices. This was ameliorated some by the opening of the big Super C at Atwater Market, which generally had much lower prices than either IGA. I was thinking about all of this as I was reading an excellent article on TheGrio about food insecurity and food gentrification. The article was written by Mikki Kendall, an African American feminists in the States, about the process of food gentrification. Kendall writes about having grown up poor and eating the more undesirable cuts of meat, like hamhocks, neck bones, and the like. She recalls her grandmother being an expert at turning “turning offal into delicious.” Kendall notes the gentrification of what I call poor people’s food. As haute cuisine chefs re-discover these traditionally less desirable foods and turn them into fancy dishes for the wealthy, it drives up the prices of these cuts. Yet, as consumers range further and further afield from their traditional diets, each new “discovery” comes at the expense of another marginalized community. Complaints about the problem are often met with, “Well, eat something else that you can afford” as though the poor have a wealth of options, and are immune to dietary restrictions based on religion, allergies, access, or storage capabilities. So, ultimately, the poor are left to eat processed food, which isn’t good for any of us. That is the only thing that is easily accessible. When I was student, I noted with deep and bitter irony that the cheapest meal option was often McDonalds. Or, if I went to the grocery store, aside from Ramen noodles (a processed food I cannot stand), the cheapest option was Kraft Dinner (or Mac & Cheese for you Americans), another slightly vile processed food (full confession: KD remains my comfort food of choice, I import large quantities of it from Canada). And the end result of all of this bad, processed food is the toll it takes on the health of the poor, both in urban centres and rural areas. In the United States, African Americans are, on the whole, poorer than everyone else. In Canada, it is the aboriginals. It is no coincidence that food insecurity hits African Americans in the US hard. It is also no coincidence that rates of heart disease, hyper-tension, diabetes, and obesity are much higher in African American and Canadian aboriginal communities than in the rest of both nations. I got an email from Dave Flavell the other day. I’ve known Dave for a few years; he contacted me awhile back for some help on a project he was doing on Griffintown. He was collecting oral histories of the community and its diaspora, with a view towards publishing a book. Last time we talked about it, he said the book was on its way to publication. This email contained photos of Griff, in particular of the Horse Palace on Ottawa street, taken in 2011, 2013, and 2014. The changes are stunning. In the first photo, we look down Eleanor street at the Horse Palace, built in 1862, standing at the end of the block on Ottawa, surrounded by huge trees. Time was these were amongst the only trees in Griffintown a hundred years ago. The old St. Ann’s Kindergarten is on the left, now the headquarters of King’s Transfer, a moving company that’s been based in the neighbourhood for almost a century. It’s also where I conducted the majority of the oral history interviews for House of the Irish, thanks to the generosity of Bill O’Donell, the president of King’s. In this picture, the Horse Palace looks much as it has for the past thirty-forty years. But a closer look shows that it’s already under transformation. Leo Leonard, the legendary proprietor of the Horse Palace, and his wife Hugeuette, had already sold and moved to a retirement home. Leo, though, did not get much of an opportunity to enjoy retirement, he died in in July 2012 at the age of 87. Already, the building is under renovation, new windows have been put in on the second floor. But the actual stable, which is just out of sight, behind those moving trucks, was still in full working order. The next picture was taken last year. From the exact same spot. Now the Horse Palace residence is dwarfed by an 8-story condo built next door and behind it, fronting on rue de la Montagne. This building was under construction in 2011, but had not yet risen to dwarf the Horse Palace. The Horse Palace building looks tiny and insignificant in the shadow of the condo, which stretches across at least three lots on de la Montagne. The final picture was taken a couple of weeks ago, from the corner of Ottawa and de la Montagne, looking east. The shop fronts on Ottawa in the new building remain empty, but looking down the block, after the Horse Palace residence is the old paddock of the stable, which was bought last year by the Ville de Montréal for purposes of turning it into a park to provide access to the actual stables, which the Griffintown Horse Palace Foundation has done yeoman’s work to preserve and save. (Full disclosure: I was a board member of the GHPF from 2008 until I left Montréal in 2012). Continuing on past the paddock, another mid-19th century residence still stands. And then, at the corner of Ottawa and Murray, another, shorter, 4-story condo stands. It was built in 2011. The crane is on the site of Devimco’s massive “District Griffin” development on Peel street. Even though I have seen this view down Ottawa from de la Montagne, I was still shocked by Dave’s photo. The entire landscape of Griffintown is massively changed. The condo at the corner of de la Montagne and Ottawa is representative of the redevelopment. 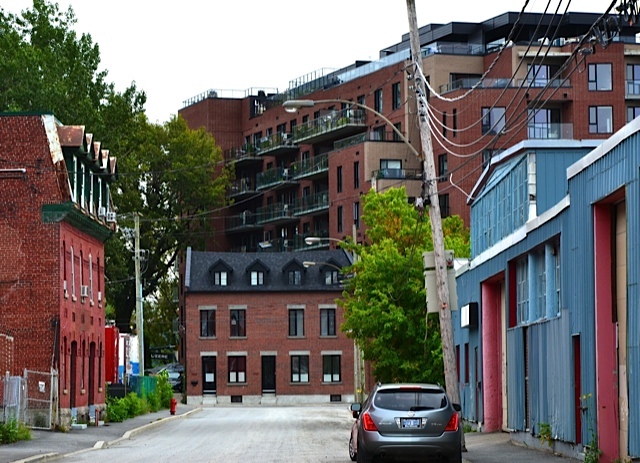 The streets of Griffintown are narrow, the buildings have always been hard up against the sidewalk. This has contributed to a somewhat claustrophobic atmosphere, at least on those blocks where enough buildings still remain. But these old buildings were 2 floors, at most 3. The stacking of 4, 6, 8, 10-story condos, lining these narrow streets only enhances this claustrophobia. It devastates the urban environment. You are currently browsing entries tagged with gentrification at Matthew Barlow.